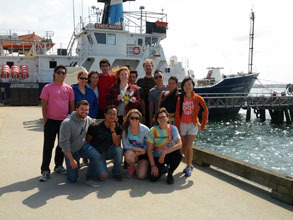 Course Description: Most introductory courses to chemical oceanography cover a variety of topics that are only related because they are under the broad umbrella of chemical oceanography. Some of these topics include carbon dioxide and inorganic carbon chemistry, salinity, marine nutrients, dissolved gases, and organic constituents. Similarly, most discussions of climate change and chemical oceanography only touch on ocean acidification. 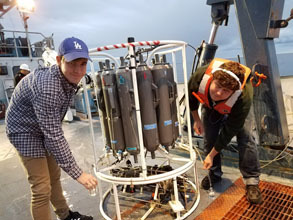 This course seeks to provide the same broad prospective to conventional chemical oceanography courses but will interweave the unifying theme of climate change into these numerous and diverse topics. 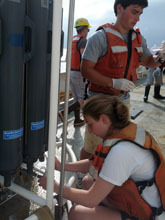 Course Description: Most courses in stable isotope geochemistry highlight the analytical techniques and classic applications of stable isotopes. While several of these topics will be introduced here, the primary focus of this course will be on the fundamental equations and models used to interpret stable isotope data obtained from natural environmental samples. Guided by several pioneering applications, not only will we learn the equations used, but we will also scrutinize their underlying assumptions as we set-up and derive these models. The goal of this course is to equip students with the fundamental knowledge needed to both dissect as well as manipulate traditional stable isotope models so that they can analyze their own data in the most appropriate and intelligent fashion. The first portion of this course will be theory based, investigating and manipulating stable isotope equations and models. The second portion of this course will be research based, investigating and interpreting stable isotope data with newly developed models and equations. Course Description: This seminar will focus on the IPCC 2013 Working Group I report (Physical Science Basis). The IPCC stands for Intergovernmental Panel on Climate Change and is the main international organization for assessing the current state of scientific knowledge for global climate change. The IPCC reports are a result of contributions from thousands of scientists from all over the world, and are a comprehensive summary of the current state of climate change research. The course will be conducted in a reading-and-discussion format. Students will be expected to lead some of the discussions as well as actively participate in all of the discussions. 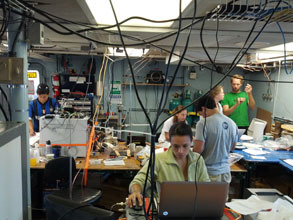 Course Description: This course will follow the scientific process conducting oceanographic research in the laboratory and at sea. 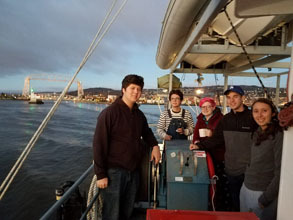 This course will begin during the Spring Semester, will extend into the summer with a research expedition at sea lasting approximately 2 weeks, and will conclude during the Fall Semester. 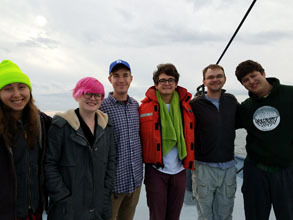 During the Spring Semester (EES 312W), this course will meet for 4 Credit Hours and students will work together and with the instructor to develop scientific hypotheses related to modern oceanographic biogeochemical processes. The students will also develop their own experimental plan to test their hypotheses, will formulate a formal written research proposal for their proposed research, and will begin their experiments. 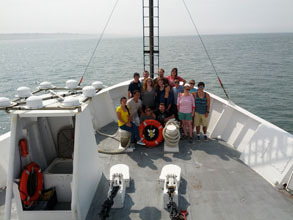 During the summer, students will enact their scientific plan at sea during an expedition lasting approximately 2 weeks. 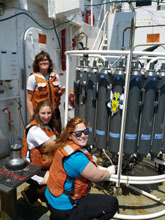 During this time period, students will collect samples and make measurements at sea with the instructor, other professional scientists, and graduate students. During the Fall Semester (EES 313), the students will reconvene for another 2 Credit Hours to analyze their data and create formal presentations of their scientific work in both written and oral formats.